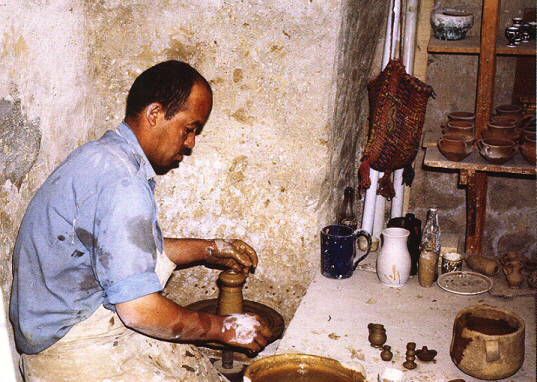 A potter was a common occupation in the Biblical world (Jer 18:3-4). While the very rich could afford vessels of silver, gold, carved stone, or even of glass by Roman times, most people used common fired clay vessels for everyday use and storage (2 Tim 2:20). These might range from simple plates or cups to very large pots for storing grain or wine (in the Roman era called amphora). Besides kitchen utensils, many other items were made of pottery, such as lamps, pitchers, buttons, toys and games, and molded figurines that served as idols. Although fired clay pottery was relatively brittle and could be broken if struck, it was extremely durable. It could keep contents nearly watertight and resisted decay and corrosion. Many clay vessels have been discovered that are in excess of 5,000 years old. Many of the fragile parchments of the Dead Sea Scrolls were found preserved in huge clay jars that had kept them largely intact for 2,000 years. Even broken fragments of pottery (called potsherds or shards) were used as a kind of notepad to write letters, make lists, or to practice writing. Because different people in different areas and at different times developed very distinctive types of pottery and decoration, as well as techniques to make it, pottery has become an important tool for historians in identifying and dating archaeological sites. In some cases, a site can be dated within the range of a few years or decades by the pottery found there. While much of the pottery of Palestine was generally of high quality, the many wars and hardships throughout its history are also reflected in the varying quality of its pottery. Vessels were also imported from other areas, especially Grecian ware, the elaborately painted Philistine pottery, and later the high quality china-like pottery of the Nabateans. During the Roman period, pottery making in Palestine reached a new high as delicate and elaborate styles from throughout the Mediterranean area were copied by Palestinian craftsmen. It is not surprising that as common as pottery and potters were in the ancient world, they should figure in biblical stories. For example, Gideon took advantage of the portability and fragility of pottery jars to surprise and rout the Midianites (Jud 7:15-23). They also became frequently used metaphors in Scripture. The idea of God as a potter patiently shaping the world and human beings to his specifications undoubtedly lies behind the creation narratives in Genesis 1-2. This theme of God as a potter, fashioning or refashioning the world or nations according to his purposes became a common idea throughout Scripture (Jer 18:1-6, Isa 29:16, 45:9, 64:8, Job 10:9, Rom 9:20-24). The fragility of a pottery vessel was used to communicate human frailty (for example, Lam 4:2, 2 Cor 4:7), while the potter's clay could be contrasted with iron for the same purpose (Dan 2:41-43, Rev 2:26-27). Likewise, a broken vessel communicated total destruction or worthlessness (for example, Psa 2:9, Isa 30:14, Jer 19:10-11).